Psalm 1 is one of my favorite Psalms of all. It is one of my greatest motivators to discover God through His Word. The contrast between the tree and the chaff blown by the wind is pretty stark. The tree that is planted by the river, brings forth fruit and its leaf does not wither. Like that tree, those who refuse to be carried by the current of influence that comes from the ungodly, sinners and scornful will prosper. We live in a fog of information and communications. These voices are powerful influences. It is important for us to carefully sift through these messages that can very subtly pull us in wrong directions. I love this information age and the ability to communicate with so much ease. This Psalm reminds me to stay aware and and to keep the constant flow of God's truth going. This is done through the activities of church and this kind of personal Bible study. I often have to identify wrong thinking and distractions. Life is a battle not a picnic. Thank God for the way He alerts us to this battle. I praise Him for His patience, forgiveness and mercy toward us. I also love to think that God actively watches over me and helps me in my effort. “The Lord knows the way of the righteous.” I don't always think of myself as "the righteous". I don't always get everything right. This Psalm identifies the righteous as those working to pay attention to God's Word. 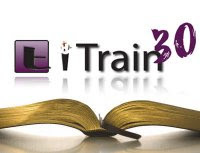 Here is the reading for day 2 of iTrain30. Thanks to those who have left comments about your reading. It is encouraging to read them. I do delight in His law(word) so much! When I have neglected my time with Him the things I take in from the world through work, TV, news, media, etc. seem to weight me down. But His word cleanses me, strengthens me, and guides me in wisdom and discernment! I am so glad He is going to finish His work in me! I need Him! Sanctify me by your word oh Lord! Read it, Walz-Fam.....Gary left enough comment for all of us... ;) Love Ya Bro. Yes. we are in. Looking forward to the next 30 days. The Roy's also read it... That Prov 1 is one of Greg's favorite passages of scripture. Thanks for the overall challenge of 30 days in the Word. I can think of no better way to to keep in touch with other believers on a daily basis. Looking forward to tommorrow! Read it. Great reminder of His promise: obedience and focus on Him brings a prosperous life and yielding fruit. read day 2...looking fwd to your insight. I like Phil. it reminds me of how easy we have it and how hard Paul had it and yet he cont. w/a positive God Glorifying attitude...PS 2 motivating. Living life boldly for Christ, Paul is an awesome role model for us to follow. Psalm 2 is a breath of fresh air, considering that this is an election year. I do enjoy reading the book of Proverbs. It provides insights and wisdom on how to live life by honoring and respecting God. The fear of the Lord includes reverence for and a trust/commitment to the Lord and His will. Wisdom, it would seem is following the King's design for human happiness. Honoring your father and mother is the first commandment with a promise. Hearing a father's instruction and listening to a mother's teaching is part of our acquisition of wisdom. The family is God's idea and the basic school for instructing childern. The foundation of the family's instruction should be the fear of the Lord. Eddie I think I got it right this time I will respond each day I love this and thank you for doing this. Pauls genuine love and devotion to the church challenges me! He completely emptied himself so that God could be glorified through him for the benefit of others/the church--to be that selfless is really something--a full life and true purpose!